This silky smooth Parsnip and Celeriac Soup with Tarragon is a great start to your Christmas dinner. The parsnip and celeriac are roasted until they are caramelised. The roasting enhances their natural goodness and inherent sweetness. This soup is creamy and earthy yet light. The apple cider vinegar mustard adds a zesty bite. The roasted hazelnuts add a lovely crunchy texture and a beautiful sweet and nutty aroma which combines well with the subtle sweetness of the root vegetables. Place the parsnip and celeriac in a single layer on a lightly greased non-stick baking tray. Drizzle with olive oil and season with pepper and salt. Roast for 25-30 minutes or until soft and caramelized. Heat olive oil in a large saucepan and fry the onion and garlic for 5-6 minutes at low heat until the onion is soft and browned. Add the caramelized root vegetables, vegetable stock, wine and bouquet garni. Bring up to a boil, lower heat and allow to simmer for 15 minutes. Just before serving, stir in the apple cider vinegar mustard. 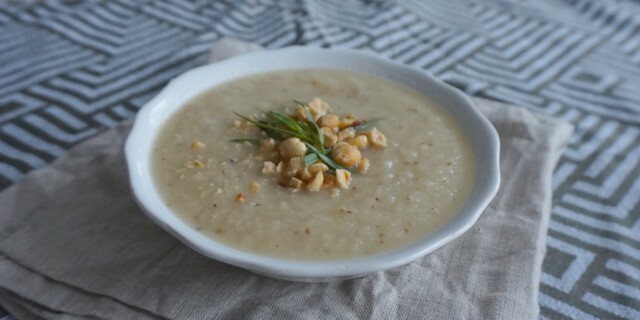 Serve with finely chopped fresh tarragon and chopped hazelnuts sprinkled on top.